Remember the old bt878 PCI cards for video capture and TV tuners? Also sold as Hauppage WinTV cards? I seem to remember a way to get them working with BTV under OS8/9, but I seem to have forgotten. Just installing BTV complains there's no drivers for any input cards. Does anyone remember any magic to make them go? Here's some resources I've found for early OSX, although I haven't gotten any of them working on a 10.2 beige g3. So far, I haven't gotten any of those working, and still haven't found much info on using the card with OS9. Man, I used to love those Brooktree cards. They worked great under Linux and you could find them so, so cheap it was ridiculous. (At one point I bought a tunerless one bundled with the word's cruddiest NTSC camera as a "webcam" for less than $30 new.) No idea how to use one under OS9 though, sorry. Yeah, that's what this card was originally for when purchased new. I was using it under linux both for the tuner and the composite input. They were pretty useful to the single geek living the spartan linux existence. Thanks for that! I tried those and didn't seem to get very far. It looks like the non-FM version of the ixmicro/IMS tuner card is <$10 on ebay, so the most practical solution is to just get that. I came across BtDigitizer (from the same guy that did the MacTCP 2.1 patch, and a bunch of other cool stuff), but that seemed to only support the composite input and not the TV tuner. I wasn't able to get it working in any case. But, of all the things I've tried, the one that got the farthest is actually some old OSX source that was sitting in Apple's old CVS repository on anoncvs.opensource.apple.com, which doesn't seem to have too many mirrors online, but I've got an old copy. They used to allow rsync access of the actual ,v files for mirroring, but restricted access to CVSROOT, which made it a bit difficult to actually check out old copies of the source. In that repository was a quiet little directory called 'AppleBt8xx'. It was a kext to support the brooktree chips, and a simple app to control it. It's very rudimentary, but at least displays video. No audio. As you can see, the video is being DMA'd from the card into the framebuffer, but it's not quite inside the bounds of the app's window. There's some bugs, but it's working better than anything else I've tried so far. My card has a 3.5mm jack for audio out, and I've tried plugging headphones in, no luck on the audio. In the 'vdig' resource, it has strings for 'pci109e,350', 'pci1461,1', and 'pci1852,1852'. This pci.ids list indicates 109e,350 is the brooktree vendor id and bt848 device ID, and 1461,1 and 1852,1852 are two possible subvendor/subdevice ID's. My card looks like it has both 109e 36e (bt878 video) and 878 (bt878 audio) device id's, both with subvendor/subdevice of 70/13eb. In an OF device listing, it shows up as pci70,13eb@F and pci70,13eb@F,1. I'm trying to figure out why audio isn't working. One idea is the ix software doesn't support the bt878, a hypothesis that might be supported by the 109e,350 PCI ID matching for an 848, but no equivalent for 878, I'm not sure. I have one of the Conexant Fusion 878 PCI cards here. Being able to record video from composite sources in Final Cut Pro would be incredible, especially since it's already a decent audio workstation with the addition of a Sound Blaster Live 5.1. It would be impressive for a 13 year old machine to still serve a useful purpose. I'll get involved in this project over the next couple of days once I've finished rearranging my workspace. Any recommendations for recording hardware? I have a Power Mac G4 QuickSilver 733MHz (No L3 Cache) with an ATI Radeon 9000 Pro that will have to do, although I may be able to source a 933MHz processor card with 2MB L3 Cache to give the machine a noticeable performance boost. If I can record video from VHS cassettes at 640 x 480 resolution I'll consider that a success. LOL! I've been procrastinating something like thirteen years about digitizing my VHS collection on the Radius 81/110 with VideoVision Studio. Is it getting hard to find current toys for doing composite or just toys for doing it classically? iMic: I got an ixmicro tuner card (non-FM, it also has a composite input and 3.5mm TRS audio input, but audio output is through the internal connections for the CD drive). In comparing the two, I think the problem with my 878 card is how it shows up in OpenFirmware. When you do a "dev / ls" in OF and see how it shows up, the ixmicro card shows up as pci109e,350 which is the correct vendor id/device ID for the card. However, my 878 card shows up as two instances of pci70,13eb, which is the subtype and sub vendor ID. The ixmicro card is the one showing up correctly. The 878 uses two PCI devices, one for audio and one for video, and these two devices will each have their own subtype and sub vid. So it should be showing up as pci109e,350, which is the vendor ID for brooktree (109e), and the device ID for the Bt848 (350), and then have two subdevices one for audio and video. For whatever reason my 878 card isn't showing up as a single device with the proper vendor/device id's. That's then throwing matching all off, and AFAICT, all the software is only matching the video and not the audio portion, which is why I can get video working but no audio. If your 878 card shows up correctly in OF, I think you should be able to modify the ixmicro software like I did and have both audio and video working. The two things to modify are both the ixtv application and the vdig extension. The vdig extension should allow it to work with other QT recording software. My primary goal was to get the tuner portion working with my analog cable tv system, which I eventually did. It's in a G3 AIO (thanks uniserver! ), but the framerate is really pretty low. Maybe 15fps or less. This could be due to the onboard video of the beige g3 being kind of anemic, I'm not sure. jt: I tried to do some composite NTSC capturing with the radius video vision, but the picture ended up being very poor quality. I'm not sure what's up. It couldn't have been this bad new, so presumably something has happened to it in the last 20 years to cause the poor quality, but I'm not sure what. Hopefully yours will work better. As for composite video capture on modern systems, there's a lot of fairly cheap options out there. Both firewire and USB capture devices. Firewire works out of the box with OSX (they basically show up as DV cams), but USB is a little more complicated. There's a ton of cheap USB composite capture devices out there, but most of them don't work with OSX. So if you're looking, make sure you find one that advertises OSX compatibility and has available drivers. I've always preferred FireWire solutions, though the Aurora Fuse card I've got has MJPEG hardware acceleration. It's been a long time since I've had occasion to do so, but I have a couple times utilized the capability of an old cheap Canon DV camera to act as an NTSC-to-Firewire bridge. DV cameras like it are practically worthless now so if you think you might ever need a video capture device that might be a way to go. At this point, the VideoVision Studio option is probably more of a "because I can" option than anything I'd probably use once I got started on the library. 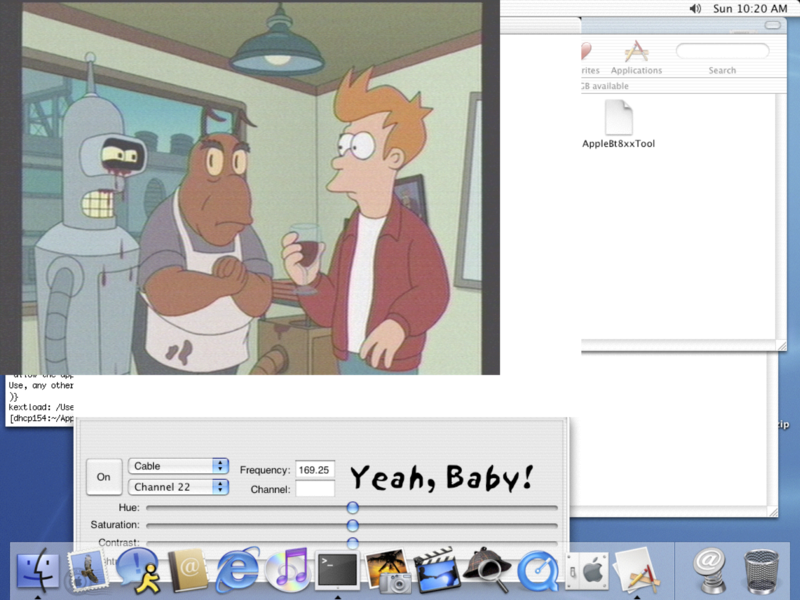 FireWire sounds the most flexible and I might consider doing VidCap under 10.4.11 if needs be. Native9 would be preferred, with Lubuntu on one of the two ATOM systems over USB2 a close second. Biggest stumbling block is finding an S-VHS VCR with a reasonable price/shipping cost whenever I get ready to roll. S-Video capture would be the ticket. I have the Fusion 878 running on OS 9. As I discovered my card identifies to the system exactly the same as bbraun's, so I modified the ixTV software to recognise the composite input and configured the sound input to use the Creative Sound Blaster Live 5.1 line in. The video passes through correctly, and the input quality looks fairly decent coming from VHS. But whenever I click record, the computer locks up. I've installed the BtDigitiser extension and using that as the digitiser the machine records video without any problems. No dropped frames, audio works using the SB Live hardware encoder and decoder, it compresses and plays back in real time. I think the issue is whenever an application attempts to communicate with an already active device. 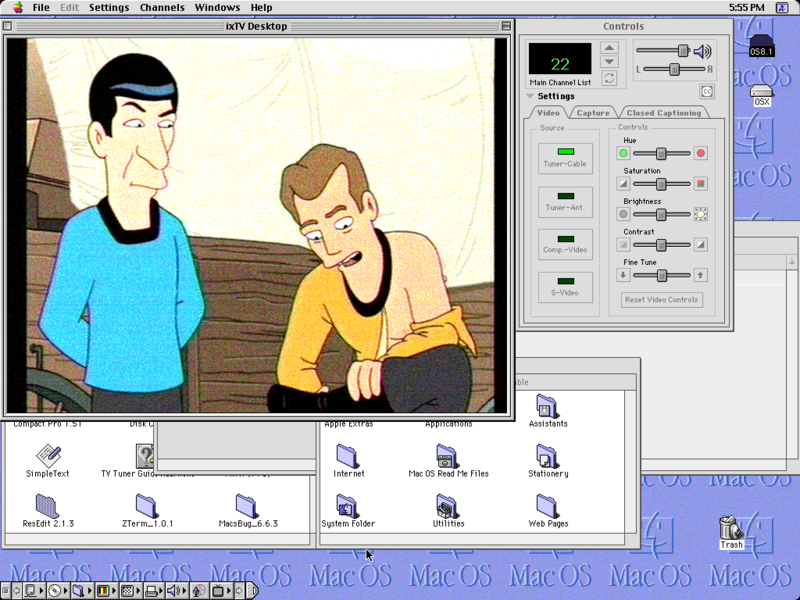 Try configuring the Sound Blaster in the Sound Control Panel while Final Cut Pro is running and the system locks up. Still, that's a minor issue that can be addressed by being careful with running processes. If this turns out to be a workable small video workstation I'll move the drives and components over into the G4 MDD and repair the power supply. The faster system bus, processor and L3 cache should significantly improve encoding, compression and playback performance.